On a whim, I decided to make a pie for dessert tonight. Fresh blackberries were on special in the store, and I hit upon the idea of using a jar of raspberries in syrup for the base. So I made a pie crust. Normally I would have just bought a frozen pie crust, but I've been inspired by my own success with apple pies and with Chef Tess's pie crust recipe with the vinegar in it, so I figured I'd try it. I don't know what went wrong, but the pie crust shrunk in the oven. I have never prebaked a pie crust for an unbaked pie before, so maybe I just did it wrong? But the pie crust ended up too thick on the bottom and about a half-inch below the edge of the pie plate; it was right at the edge when I put it into the oven. Anyone with an explanation/suggestions? (Later) The crust is the flakiest I've ever made, and is really yummy! Even the gel held together really well. Thumbs up on the vinegar in the crust tip (thanks, Chef Tess! 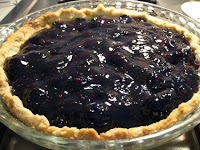 ), but I guess I just have to work on the actual pie construction. Well, practicing is not a problem! I wish I had an answer for you, but I can't make a pie crust to save my soul. I'll be interested to find out what happened with yours and how it ultimately turned out. Maybe I'll be inspired to give it a try again. My pie crust didn't even make it to the oven. Despite my allegedly tested-at-altitude (5000 feet) recipe, I just couldn't get the texture right--so I switched to Plan B: apple crisp! Looking forward to hearing how yours came out. "I Like Your Hobby Because it's Useful."